Crufts qualifications for Merry Christmas, first show ever for JFK. JFK of Randi's Ushabti made 1Very Good in open class at his very first show ever. He also obtained his certification for the LOSH breeding. I am very proud of both of my breeds. Many thanks to Michèle for taking so good care of Jinx (JFK). Judge: Mr J.L. Williams from the Netherlands. Read more about Crufts qualifications for Merry Christmas, first show ever for JFK. Merry Christmas of Randi's Ushabti made 1 excellent with CAC and CACIB at her first exhibition in intermediary class at the international dogshow of Goes in the Netherlands. She also became Best Female (BOS) and Best of Breed (BOB). On the Judge's evaluation: Nice size, very feminine, little short in head, very good body, bones and angulations, nice eyes, bite and ears, moves very well, coat could be a bit harder, very nice temperament. We are incredibly proud of our home-bred girl. Judge: Mrs. L.B.C. Liljeqvist from Sweden. This afternoon between 16:50 and 20:45 two males and three females are born. Mama Ushi and her pups are doing wonderfully. 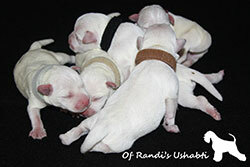 For more informations see "Puppies" or contact us. We are so incredibly proud of her.